Driving at night isn’t always easy, even if you have perfect vision. Highways are dark, country roads are unlit and certain residential areas can be difficult to navigate. Combine unlit roadways with poor winter conditions and you have a recipe for disaster. For most people though, driving after dark is unavoidable. That’s why thousands of motorists are now changing to LED headlights. High-performance LED headlights can change the way you drive. Not only do they improve your vision ten-fold, they give you more confidence when navigating difficult driving situations including icy streets and unpaved backroads. Good lightening means your eyes don’t have to work as hard to see the road. It also means you can see road obstructions quicker than with standard lighting systems. LED lighting is especially important for drivers navigating country roads where the chances of wildlife hazards are far greater than in the city. 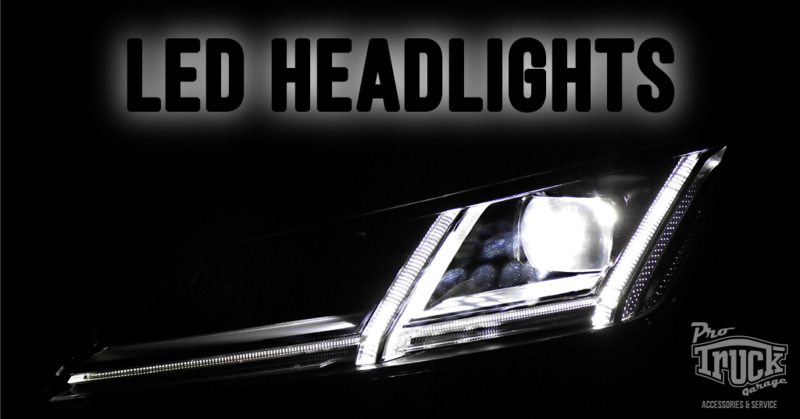 Are you interested in installing LED headlights in your vehicle? ProTruck can help! We are constantly bringing in the latest lighting systems, like adaptive xenon lighting and more. Motorists using the latest in LED-lightning technology enjoy a completely different experience when driving at night. Your lights are brighter, stronger and wider, and reflections are greatly reduced. The world of lighting is completely different than it was 10 years ago. With improvements in system optics, lenses, light transmissions, and high-beams, motorists are able to see roads more clearly, drive more confidently and avoid potentially life-threatening accidents. A top-of-the-line lighting system will change the way you drive at night. If you have questions about LED lighting, products or installation please give us a call +1 (780) 484-7570! Your Edmonton Car & Truck Service, Parts & Accessories Destination.